* This article was originally published in January 2011. Well, what a day! 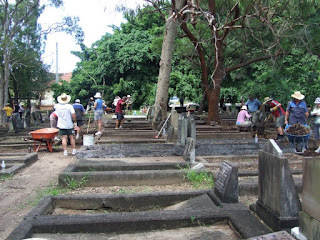 Last Sunday morning over a hundred volunteers descended on the South Brisbane Cemetery and a few hours later they had cleaned up the flood-affected parts of the cemetery. * It was the biggest clean up effort the cemetery has ever seen, and if you believe in karma, then this was karma at work. It happened almost accidentally. 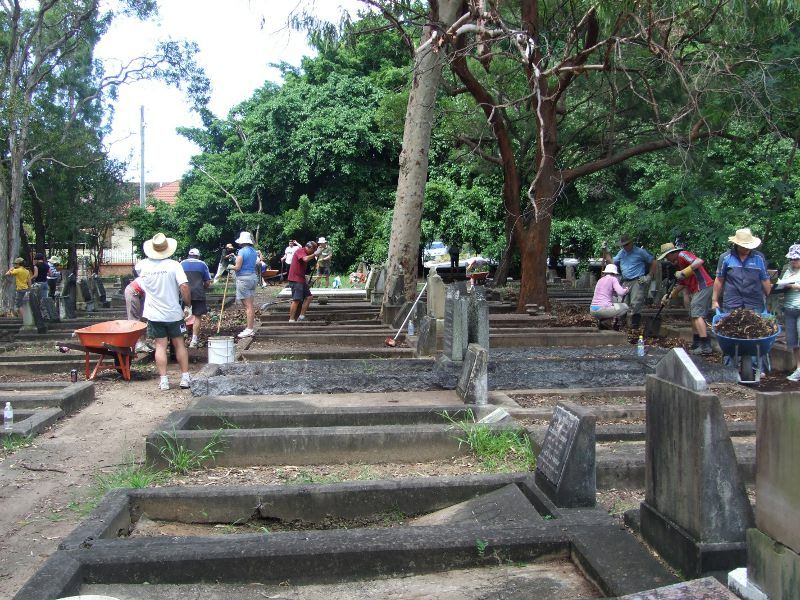 While planning the Great Graveyard Shift for the Friends of South Brisbane Cemetery (FOSBC), we sent a media release on that event to Channel 7, who at that exact same time were looking for places to add to their 'Sister Suburb Sunday' project, which involved registering thousands of volunteers and heading out to clean up flood-affected sites. This was organised with the Rotary Club and the Sunday Mail. They got back in touch us with and asked if we would like some help, and so three days later there we were at the cemetery under blue skies as the volunteers rolled in from all Brisbane. The volunteers got down to work with rakes, brooms, shovels and wheelbarrows, and very soon the roadside was filled with debris that had previously covered pathways and graves. Rotary set up two free food and drink stations to help keep everyone going, and by the afternoon we had achieved all that we had hoped to and more. 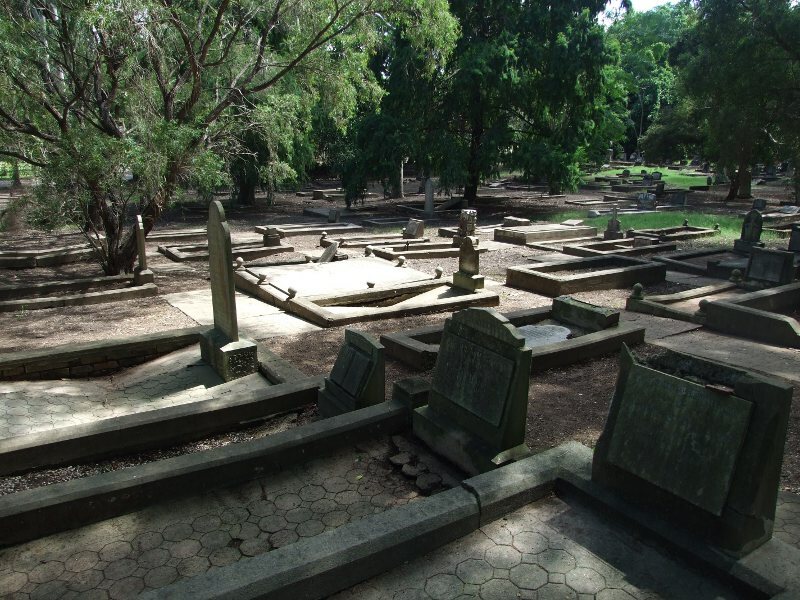 Sections of the cemetery that had previously been swamped by muddy debris and dead branches were clean, tidy, and looked better than they had in many a year. The clean-up was one of those great days that the FOSBC will long remember. 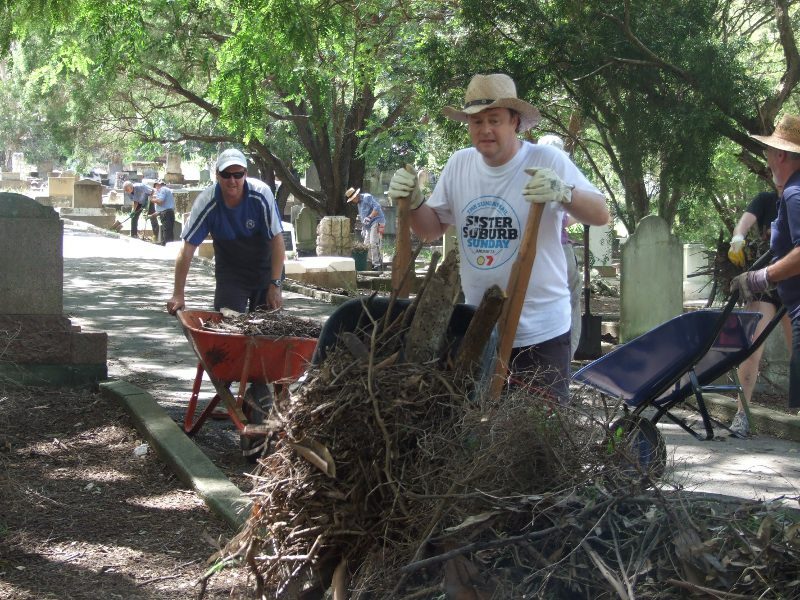 We use the word 'karma' here because the FOSBC secretary Tracey Olivieri, who has for so long struggled to maintain the cemetery with a small group of women, was in tears at the sight of so many good people rolling up their sleeves and pitching in. Tracey had spent most of the previous two weeks in flood clean-up mode around Goodna as a private citizen and as a council employee. In a strange way, the floods were very good for the cemetery. No real physical damage was done, but the muddy mess prompted the city council cemetery department to engage in an overdue clean-up of the grounds and replace lost FOSBC equipment. It also led to 'Sister Suburbs Sunday' and a whole lot of new people seeing the place for the first time. We can well do without any more floods here, but there thousands of stories about the good that this disaster has brought out in people, and this was one of them.